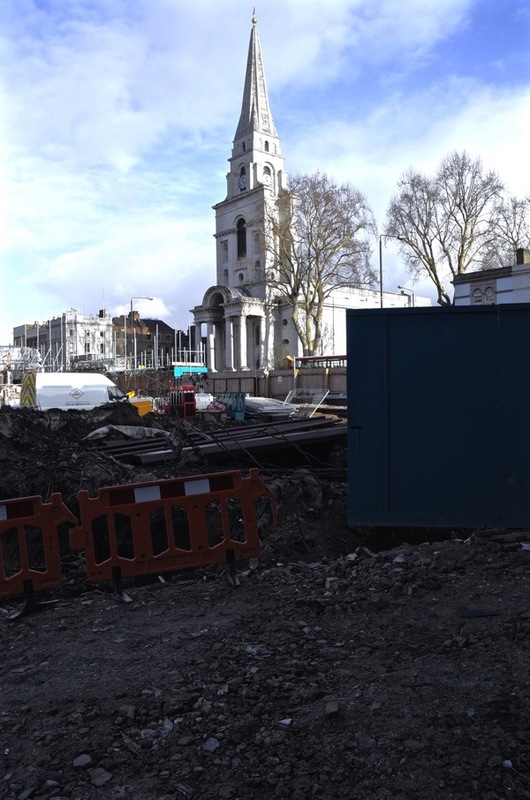 This winter, Spitalfields has become a battleground and – thanks to the intervention of the Mayor of London – this is Christ Church seen from across the muddy waste where the Fruit & Wool Exchange used to be. Historically, only Henry VIII has been responsible for a greater degree of destruction in the neighbourhood, when he ‘dissolved’ the Priory of St Mary Spital with its large public hospital in the fifteen-thirties and took the fields to create an artillery ground for his soldiers to practise. 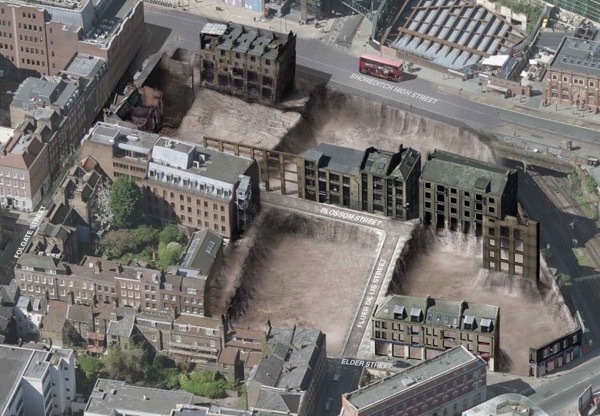 If Boris Johnson gets his way by approving the overblown developments in Norton Folgate next week and upon the Bishopsgate Goods Yard in March, he will surpass Henry VIII to become the single most destructive influence upon Spitalfields. Yet, in common with other tyrants, there is a degree of arrogance involved and in Boris’ haste to determine these building schemes before he is out of office in the spring, mistakes have been made which present the opportunity to stop him. In his tenure, the Mayor has exercised his authority to over-rule local authorities and give his approval to a dozen development schemes in London, which makes the outcome of his forthcoming call-ins for Norton Folgate and Bishopsgate Goods Yard appear predetermined. As if – in the case of Norton Folgate – the designation of the site as a Conservation Area, more than seven hundred letters of objection (two hundred discounted for lack of postal address), a unanimous rejection by the Tower Hamlets Development Committee and five hundred people joining hands around the site, count for nothing in face of the wishes of one man. Through a Freedom of Information request, the Spitalfields Trust has uncovered procedural irregularities in the handling of the Norton Folgate case which amount to the Mayor erring in law. Consequently, they have launched a Judicial Review challenging the legitimacy of the call-in and rendering next Monday’s hearing a charade in which the Mayor’s decision will be worthless pending the Judicial Review. The Mayor and the officers of the Greater London Authority are obligated to read planning applications and assess them objectively and neutrally, yet a member of staff at GLA sent an email to British Land’s consultants DP9 at 10:48am on 10th September – the morning the application arrived at City Hall – confirming the Mayor’s intention to call in the application. Although the GLA had already been consulting with developer British Land, they did not take time to examine application in any depth even though they had fourteen days to do so. Text of email to British Land’s Planning Consultants DP9 from Greater London Authority sent at 10:38am on 10th September the day of receipt of the Norton Folgate Application. Additionally, the Spitalfields Trust asserts that the Mayor’s decision to call in the application was unlawful on several other grounds. They question his claim the Norton Folgate development would have any significant impact on the London Plan because it is relatively small and they reject his statement that the Norton Folgate development will have an impact on the adjoining boroughs of Hackney and City of London when the site is entirely within Tower Hamlets. Eventually, someone was going to challenge the Mayor’s belligerent style and it is happening in Spitalfields because no less than the future of our neighbourhood is at stake, and we will not let it go to serve the whim of one capricious individual. thanks for this. please keep us posted. A powerful and honest assessment of the current position. Well said! Sorry I can’t be at the hearing I person but you have my full support in spirit! Dear Gentle Author, I love the fact that you are anything but gentle, when pressurised. Thank you for harnessing the interest and popularity of this blog, its enormous artistic, historical and social value, to raise awareness of the many political issues within our community. Spitalfields Life has become an asset and a force to be reckoned with. Thank you again, for your inspiring creativity and tireless campaigning. Glad you called him a tyrant, because that is what he is. And it never, ever ends well for tyrants. But because they are tyrannical and egotistical and so pleased with their general fabulousness, they never think it will happen to them. Fate knows better. More power to you and to the campaign to fight the outrageous philistinism of the moneyed. Many thanks to the GA and everyone concerned for all their hard work in fighting this very worthwhile battle. Boris would deride the likes of Kim-il Jun and Paul Kagame but I’m not sure if I can see any difference. Democracy is a word that seems to have no meaning for people like these if it means they might not get their own way. They ride rough shod over those they must view as obstacles. Well done to those who are prepared to challenge him. And let’s hope he never becomes leader of the Tories. This is one of your very best blogs, and that’s saying a lot. Thank you. Thank You courageous Knight for battling this Tyrant and destroyer of lives! I am sending, in thoughtwaves, my greatest respect, admiration and love for you, you indispensable person of monumental importance for London! Londoners present (and past, if possible) stand in solidarity with you in this battle. What is life for? THIS is what life is for! Robert Moses of New York City believed he was unstoppable too. And look what happened to his well-laid plans, thanks to a Knight like you — Jane Jacobs! Well done GA. Is there any chance of extraditing Boris Johnson back to his birthplace of New York City, and get Jane Jacobs to meet him off the plane. I’m sure that she could find a suitable use for him. 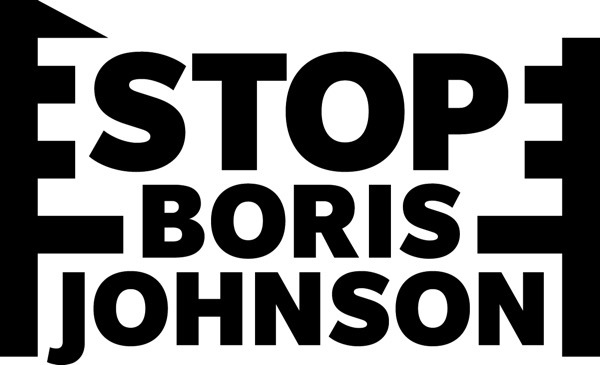 Boris must be stopped and everyone involved in the battle against him must win, he is, as you say, a tyrant, and the damage that he has already done is irreparable. London deserves better!! Well done for your part in this campaign GA. I do not live in London, but visit quite a few times in a year. This is my favourite part of London and it is a disgrace what that Philistine (Johnson) is trying to do. Good luck in your campaign and keep us informed. Gosh, well done to all who took the time to pick through all the possible ways of over-turning this. I know a huge amount of work is involved and that there are many other people who will have given their unpaid time and effort to this. Very well done to all. And HUGE thanks. And fingers crossed for Monday. 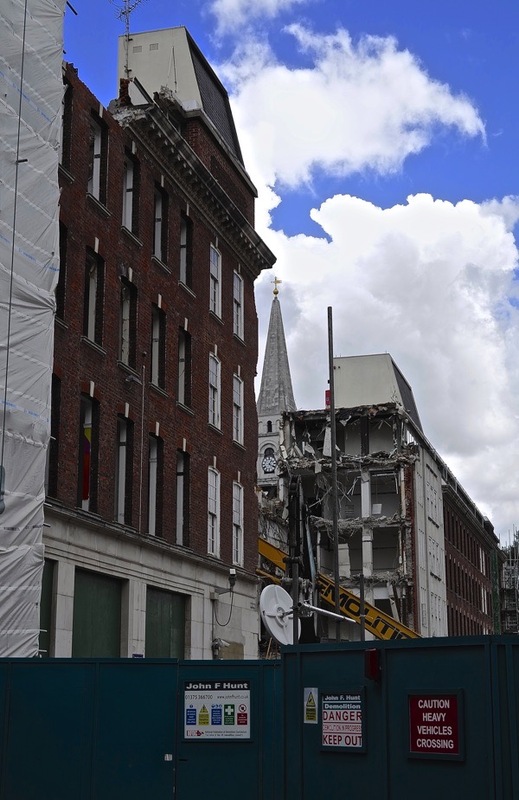 What sad shot of Christ Church with the FAWE gone forever…sheer vandalism! I do wish I could be down for the meeting but unfortunately I cannot… but am there in spirit. Fingers crossed and thanks to all for their great work in trying to save an important part of the great City. Roll on spring when hopefully a new mayor will be less intent on the destruction of our heritage in order to achieve some perverse momentums of their time in office! Let’s just hope the decision on NF and BGY can be postponed or appealed until then…. office is nearly over before he can do any more damage. So dismayed at his power to destroy. What a philostine. I am so ashamed of you Boris. My heart breaks if you get your HORRENDOUS WAY! How can you see such destruction of OUR Historical Buildings IN YOUR NAME!!! I used to be a big fan of Boris as he was at one time our MP and I met him a few times and he did some good work. I am now very disappointed that he should turn his back on this situation and let a very important part of our heritage be destroyed. I do not understand why it is thought better to pull down these beautiful buildings with such history and replace them with new structures very like lots of other offices that can be seen anywhere. very disappointed. Once Boris has left office to venture into the world of ‘Priministerial Appointment; he will have forgotten all about Norton Folgate and all his other whims at the closing of his office. We cannot allow this one man to get away with this when it affects so many so much. And yes I too have met Boris and spoken with him in the past when I thought he was a good Minister. I even have a few letters and photos his sent to me during his time at the Spectator. So for me to venture against Mr Johnson I do not take lightly. Politics has turned a dam good soul. Berlin wouldn’t be the city people & travellors enjoy most if in the late 80ies young students occupied the old houses in Kreuzberg and Schöneberg, now inner city, best places. There were hard fights with government & police. But today all were looking with respect to those who really fight for reconstruction and a generation of students worked and restored the houses with their own hands. After 1989 a lot of investors, architects came to Berlin and now have a look what we have got: bad architecture around Potsdamer Platz, Friedrichstraße, Alexanderplatz.